The surfboard and paintbrush have long been constants in the life of Wade Koniakowsky who was painting by the age of six and surfing before he reached 12. After years of incorporating both passions, he has grown to be one of the nation’s leading ocean-inspired artists with work currently showcased in 17 galleries from the East Coast to Hawaii. “I’ve always wanted to be an artist- it was all I did as a kid and I was very ‘right-brained,’” he says. CheckAdvantage is proud to present select works from Wade Koniakowsky on our checks, address labels, and checkbook covers as part of our Licensed Artist Series. 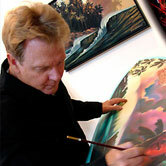 Wade’s art is “Ocean Inspired” and created through the use of oil and acrylics. He prefers to work in 2D rather than 3D because of its broader applications. Not only does the sea give him the ideas for his art, it provides some of his best customers as well! Wade’s hand-painted surf boards are some of the most sought after in the art world. Each fiberglass board is finished with a rich, deep-gloss coating with the exception of his wooden Alaia boards, which have the same components minus the gloss for a more organic feel. His work is so beloved by the surfing community that it’s been praised by Jim Moriarty—president of the ocean preservation group the Surfrider Foundation. Most popular among Wade’s styles is the “Polynesia Collage” which incorporates mixed media of gold leaf, block print, and painting in a way that is figurative, scenic, and abstract at the same time. Where you’re a slave to the next big wave or just love staring at the ocean, Wade hopes to impart to everyone that the world is a beautiful place. If you want to see more of Wade's work, you can check out his website at wadekoniakowsky.com.